Donald Trump landed in Israel today as part of his (already exhausting) first trip abroad as president. But things got a bit awkward this morning on the receiving line where Trump was meant to shake hands with Israeli officials. 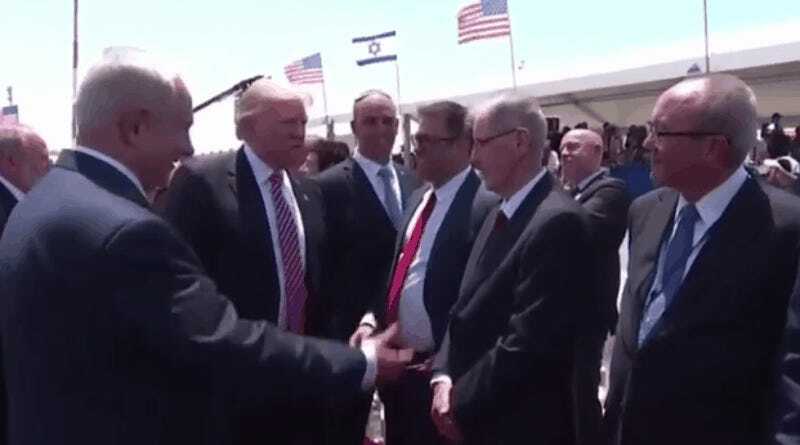 Israeli politician Oren Hazan wanted a selfie with Trump and Hazan took so long that Prime Minister Benjamin Netanyahu even tried to push him away. Trump, needless to say, doesn’t look too happy during the whole ordeal. Hazan is known as a controversial figure in Israel and has been accused of sexual assault by former employees, physical assault against a city official, and once reportedly made fun of another politician for using a wheelchair. Hazan was sure to immediately post the photo to Twitter. It’s hard to convey just how awkward the exchange was without watching video of the entire line. Trump slowly made his way down the line to meet over a dozen people, all of whom seemed to understand the protocol that you have just a few seconds to say hello. Trump’s encounter with Hazan was definitely bizarre. As you can see from the shorter video, Hazan even pulls Trump in close with a dominant and overpowering handshake, something that Trump has used repeatedly on people like Supreme Court Justice Neil Gorsuch and Japanese Prime Minister Abe. Poor Trump. It must be awkward to have someone invade your personal space like that for their own gratification. But Trump knew what he was signing up for. Hazan was just using his opportunity the way that he felt he was entitled to. When you’re a politician they let you do it.